It's the last day of this month's Mama Elephant stamp highlights. I hope you've enjoyed it so far! Today, we're showing off Blogging Buddies. I've made some wonderful friends online, and have been lucky enough to meet some of them. 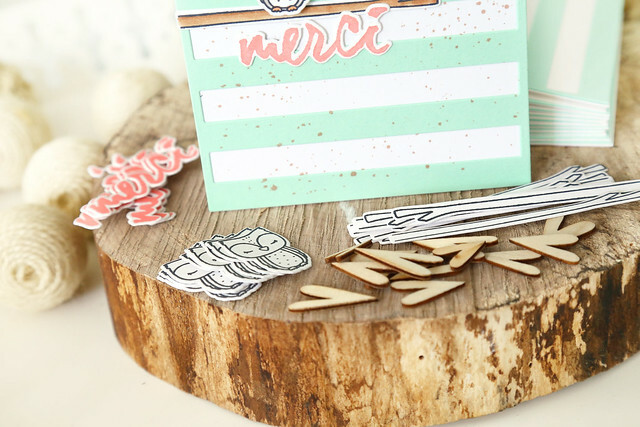 This set is perfect for sending cards to those faraway friends. It also has a great mix of sentiments that can be used without the computer/laptop images. I used the adorable hugging bears from Bear Hugs, and paired them with 2 sentiments from Blogging Buddies. It's not the best picture, but it makes me smile! 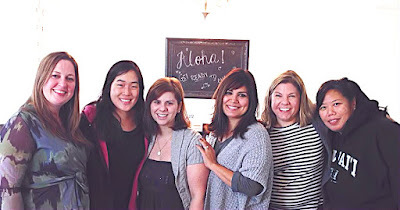 Can you name all the bloggers in this photo? They are a kind and generous and funny bunch! Welcome back to another day of Mama Elephant inspiration! Today, we're showing off the new set, Christmas Scene. It is the companion set to Christmas Spirit, which we highlighted yesterday. This is the embodiment of jingle all the way. My little elf has a ways to go to get home. I cut a path for her using the arched die from the Borderline Trio die set. Then, I cut wavy snowbanks using the Landscape Trio die set. Once the scene was set, I blended ink to create a night sky and added snow using a stencil and some embossing paste. The heat-embossed sentiment becomes part of the snowy scene. Lawn Fawn and Chameleon Pens are teaming up this week with fun Halloween projects. I used the pastel pack of Chameleon pens to color the bear from Party Animal. He's Halloween-ready, with accessories from Booyah! This was my first time using Chameleon pens, and it was fun to experiment with different markers! I like my images to be lightly colored, and look shaded. It took awhile to understand that instead of coloring first and adding the shading second (like with Copics) I had to keep coloring lightly and adding the shading a little bit at a time at the end. (I had to stop coloring every 20 seconds or so to re-click the pen into the chamber to remove saturation.) If you are confused, watch these videos! I found them very helpful to start, and then I had to figure out what worked for me. 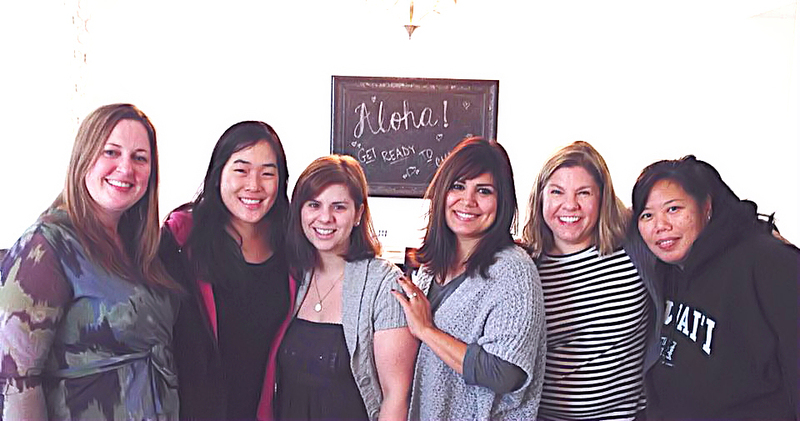 It's Mama Elephant stamp highlight week, and today the design team is showing off the new set Christmas Spirit. My scene is pretty simplistic and easy to reproduce for holiday cards. I used the new snow capped mountains die to provide a backdrop for the elf, and the only greeting is the new Merry die-cut. I used Lawn Fawn's yeti ink to add interest to the grey mountains, and liquid appliqué to puff up the snow-caps. I also flicked some white ink onto the sky-blue background layer. But those are extras that can be easily skipped if you are mass-producing this card. Hi there! I'm joining the Mama Elephant design team to show off the newly-released set, Little Edibles. When my girls saw it come in the mail, they were beside themselves because, "mom! they made a shopkins stamp set!" I found all the dessert and sweet fruit images in the set and stamped them to cover my die-cut panel. Coloring the tiny images was so fun, especially since my 2 girls were doing the same thing beside me. Once they were all colored, I lightly sponged over everything with a light brown ink. It gave the look of a sepia filter over the images and helped to soften and unify the images. 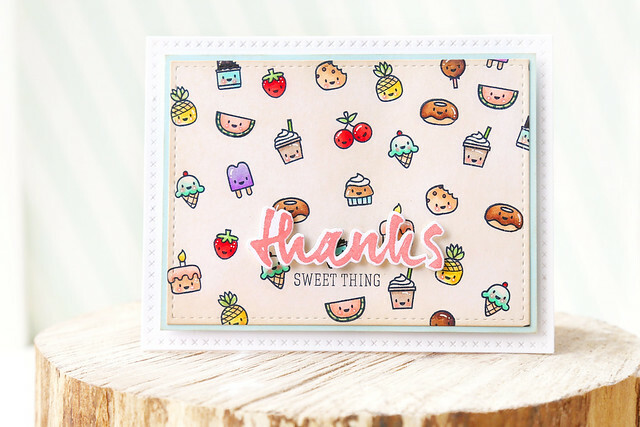 I then stamped and die-cut the thanks sentiment, and added "sweet thing" (from Cross my Heart) to tie into all the images. It makes me happy when the sentiment makes sense with the images. Hi there! I'm a day late, but I wanted to make sure you saw the tags I made for a special Simon Says Stamp blog feature. I showed how to stretch your new Mama Elephant stamps, giving the elves new faces. I hope you visit the blog and leave them a comment for a chance at some fun blog candy! Hi there! Lawn Fawn's October inspiration week is coming to a close. 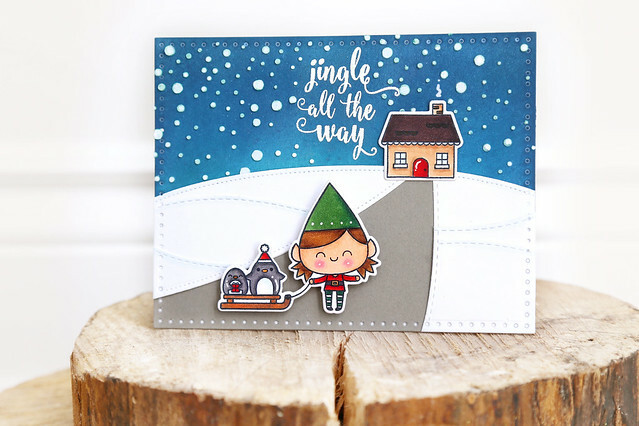 Today, we're showing off newly released dies for older sets, including one of my all-time faves - Cozy Christmas. With the new dies, this card was fairly easy to pull off (I only say fairly because I have a bad track record with heat-embossing. I hate uneven looking white embossing!) I stamped and heat-embossed all of the elements onto a single sheet of black cardstock. Then, I used a red inktense pencil to add little pops of color. Just in case you were wondering, I did try to color the little flame in orange, but he looked so weird. Re-stamp, re-emboss, re-cut. He looks much better as he is. I used Lawn Fawn's Yeti ink to add some white highlights to the mail black panel, so it could look more like a chalkboard. Everything was mounted onto it with foam squares. The different heights add so much interest to an otherwise simple card design. Hi there, and welcome to another day of Lawn Fawn's October inspiration week. Today, I'm showing off the scripty merry christmas die border. I love that it's long enough to fit on a horizontal card design! 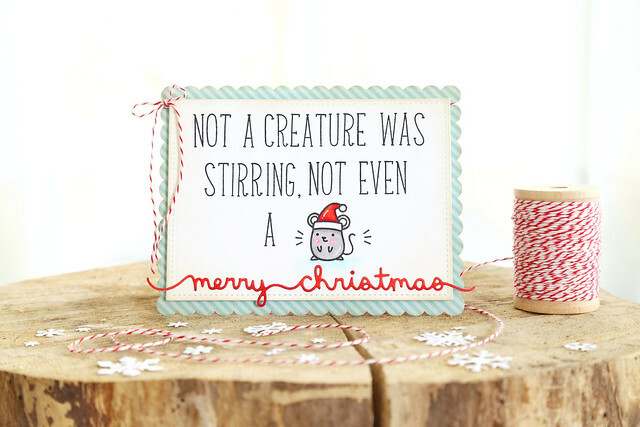 I paired it with a custom sentiment, courtesy of Violet's ABCs, and the adorable mouse from the now sold out set, Merry Christmouse. Apart from getting the letters to line up, creating this card was a breeze! I love graphic cards like this! Check out even more lawn fawn inspiration on their blog today - click! Lawn Fawn's October inspiration week continues with a closer look at Oh Snap. Whenever I hear, "oh snap!" it takes me back to that high school time when girls were more catty. If someone said something and got schooled, we would yell "oh snap!" right? anybody? Soooo, these gingerbreads are being a little catty. Standing off to the side with their holiday treats, and spectating their friend's bad fortune. He looks so pitiful with his broken leg and no holidays hat or treats. Poor guy. I can't lie, I giggled the whole time I was making it. I did some masking and partial die-cutting on the 2 mean-girl gingerbreads. The hats and accessories are from the set Holiday Party Animal. Hi there, and welcome to the October edition of Lawn Fawn inspiration week. Today, I'm showing off the wonderful Snowy Backdrops set. And, it needs to be said, Lawn Fawn's white ink is the best. Great coverage, and not of the splotchiness that other white inks may show. I combined a few other sets to create this card: the original and holiday Party Animal sets, Toboggan Together, and Trim the Tree. 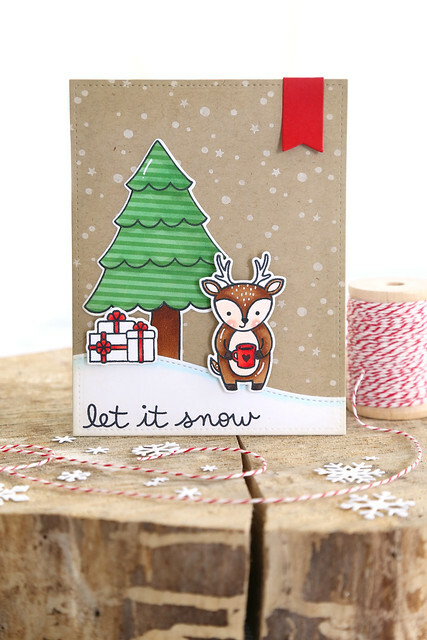 One of my favorite things about Lawn Fawn stamps is how well they work together! I hope you like it! Click over to see what the rest of the design team created today! 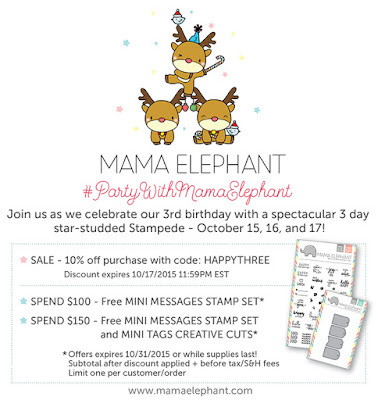 Hi there, and welcome to day 3 of the Mama Elephant October Stampede! The new release is live and available for purchase in the shop right now! What's your favorite new stamp set? I'm guessing it features these little guys! 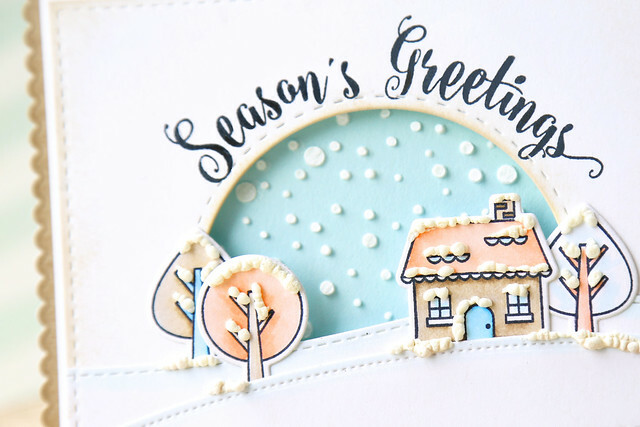 I curved the sentiment over the circle cut-out, used embossing paste to show a snow fall in the background, and liquid appliqué to add snowy accents on the trees and house. Minty green and pink tree trunks! I kept to a tight color scheme to make sure it had a cohesive and stylized feel. GIVEAWAY: Mama Elephant is also giving away three $25 gift certificates over the 3 Stampede days (today is the last day.) To qualify to win, just leave a comment on this blog post. Winners will be selected and announced on the ME blog on Monday, October 19th. Hi there! It's been a long while since I've had the energy to post anything to the blog. There have been germs and coughs and gastros and pneumonias running rampart. ugh. I did manage to pick myself off the floor to teach a card-making class a few weeks ago. I thought it would be fun to share a card I made with the class. I couldn't help but use the little owl that I drew for Mama Elephant, part of the Charmed set. I colored and die-cut the owl and his branch, as well as the "merci" sentiment, and propped all the pieces onto a minty green striped background. A bit of ink splatter and a wooden heart were all we needed to take the card from basic to wow. For most of the girls, it was their first time using copic markers and I think they were hooked. Thanks for stopping by! There will be lots of activity on the blog in the next few weeks!